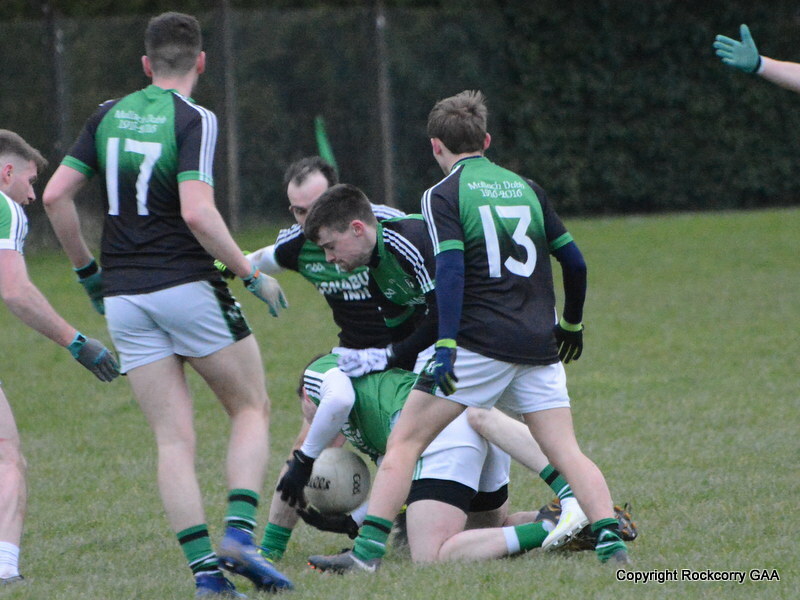 Our under 14 footballers secured a well-earned victory over Tyholland in a keenly contested & hard fought battle that was played at Pairc Naomh Mhuire on Saturday 17th May. This was a thrilling match where two determined sides did themselves and the game proud and while the scoreboard shows an eleven point winning margin a gutsy Tyholland side made us fight to the bitter end in this highly exciting encounter that produced some brilliant scores from both sides. In perfect conditions we played with the aid of a slight breeze during the first quarter and produced a fantastic performance full of skill and free-flowing football and at the end we enjoyed a healthy 3-3 to 0-5 advantage with scores coming from Pauric O’Brien (1-2), Aaron Smyth (1-0), Kyle Brannigan (1-0) and Ryan Carroll (0-1). The visitors emerged for the second period in determined fashion and fired over three unanswered points and then quickly added a goal to close the gap to a couple of points. 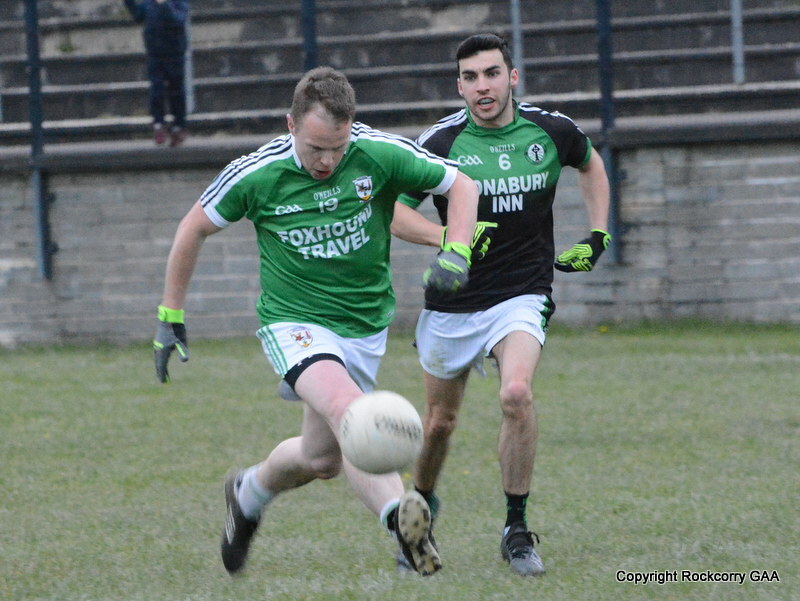 However, with virtually the last kick of the half Pauric O’Brien’s speculative attempt at a point deceived the Tyholland goal-keeper and dropped under the cross bar for a fortuitous goal which kept us firmly in the driving seat leading 4-3 to 1-8 at the midway stage. 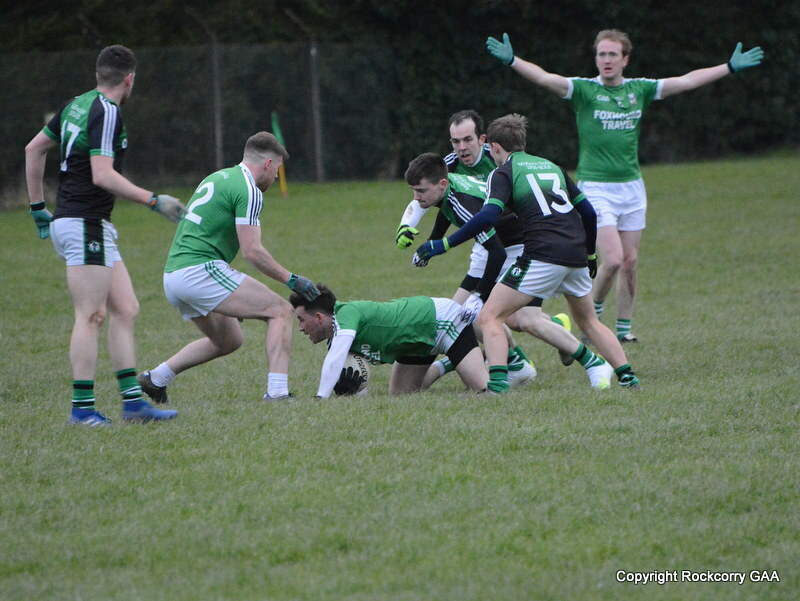 When play resumed in the third quarter it began at a fast pace with great commitment being shown from both sets of players and there were even some robust exchanges all around the field. 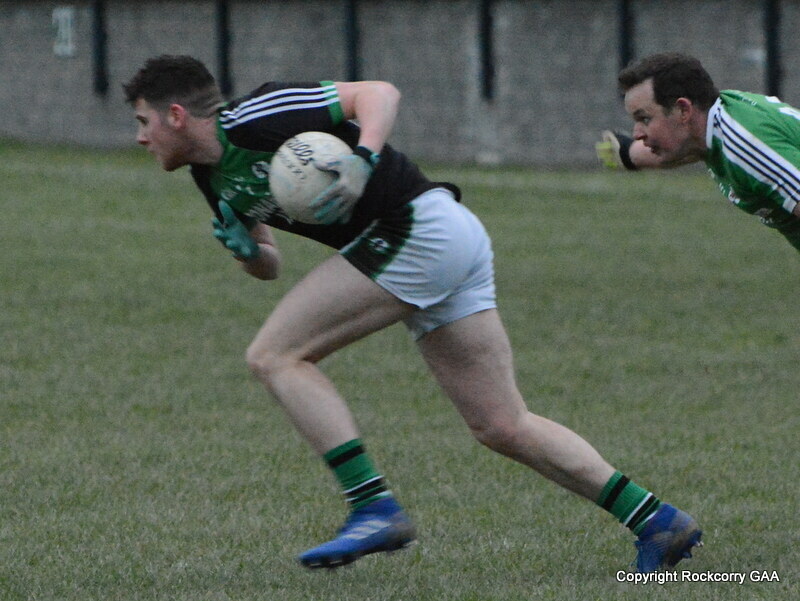 It was end to end stuff as Tyholland came out fighting but our defence were in top form and restricted Tyholland to only two points while Pauric O’Brien tagged on 1-2 to maintain our lead, leading 5-5 to 1-10. The final quarter continued to be a competitive affair with both teams enjoying periods of possession and Tyholland really piled on the pressure during the early moments in search of goals but our lads dug deep and defended stoutly and while they did manage to break through and score 1-2 we slotted over an impressive 2-3 with scores from Gerry Larmer (2-0), Ryan Carroll (0-1), Pauric O’Brien (0-1) and Kyle Brannigan (0-1) to claim the victory on a score-line Rockcorry 7-8 Tyholland 2-12. 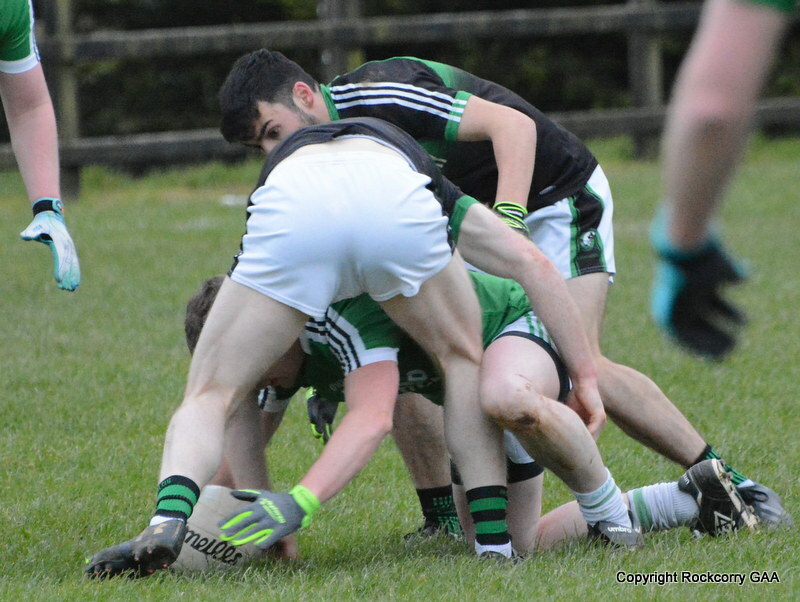 Team & Scorers: Darragh Dillion, Conor Clerkin, Ryan Lynch, Shane Greenan, Sean Markey, Kyle Brannigan, Pauric O’Brien, Caolan McPhillips, Ryan Carroll, Gerry Larmer, Aaron Smyth. Sub. Stephen Nesbitt for Conor Clerkin (injured). To view more action shots please click the link below to visit our Flickr page.